At Telligen, we believe Community is so integral to transforming the health of populations, that it’s one of our corporate values. That’s why we started our corporate Giving Garden in April of 2016 to help reduce food insecurity for local Iowans. Food insecurity is on the rise in central Iowa with thousands more people visiting food pantries every year. To address this growing issue, the United Way of Central Iowa partners with local organizations like Telligen to create corporate Giving Gardens. 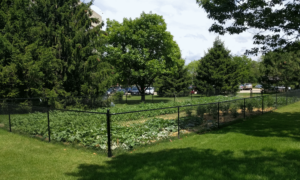 These gardens are located on land set aside in green space near company offices where employees volunteer their time to grow local produce that is donated to local organizations that serve the food-insecure in central Iowa. In 2016 when we first started, the Telligen Giving Garden produced 1,308 pounds of fresh produce for Iowans in need. In 2017, we donated 2.4 times more with a grand total of 3,178 pounds of fresh produce! This contribution fed 1,271 central Iowans! We owe the success of our Giving Garden to our employee-owners who volunteered to plant, pick, water and weed during the growing season. The garden provided a fresh way for co-workers to connect, take a break from their desks, and give back to the community all at the same time. Join us at the 9th Annual Feed Greater Des Moines Conference on Saturday, March 3, 2018, to learn more about our Giving Garden’s success and how your business can implement a Giving Garden of their own. Employee-owner Brett Williams will present with Farm Bureau Financial Services at 2:15 p.m. CST.